The majority of recent orthopaedics randomised controlled trials (RCTs) have been non-inferiority trials with no significant clinical or statistical differences between treatment groups. The aim of this study was to evaluate randomised trials for significant findings in the orthopaedic literature based on the main elective procedures undertaken across different subspecialties. We evaluated the following procedures: anterior cervical discectomy and fusion (ACDF), subacromial decompression (SAD), carpal tunnel decompression (CTD), total hip replacement (THR), anterior cruciate ligament reconstruction (ACLR), total knee replacement (TKR) and hallux valgus correction (HVC). Following PRISMA (Preferred Reporting Items for Systematic Reviews and Meta-Analyses) guidelines, we searched the Cochrane Central Register of Controlled Trials (CENTRAL, 2018, Issue 1), Ovid MEDLINE (1946 to 12 January 2018) and Embase (1980 to 12 January 2018). Trials that met our inclusion criteria were assessed using a binary outcome measure of whether they reported statistically significant findings. We included 1078 RCTs across seven most commonly performed elective procedures. Of those, only 16% (172/1078) reported significant findings [ACDF 26/77 (33.8%); SAD 2/22 (9%); CTD 11/72 (15.3%); THR 52/281 (18.5%); ACLR 21/239 (8.8%); TKR 55/357 (15.4%); HVC 5/30 (16.7%)]. The number of RCTs per year of publication has increased dramatically particularly since early 2000s—with over 100 RCTs of those seven procedures published in 2017 alone. This is the first study to undertake a comprehensive review of orthopaedic RCTs in elective practice. The number of RCTs in orthopaedic research is steadily increasing. However, only 16% of trials reports significant differences between interventions. 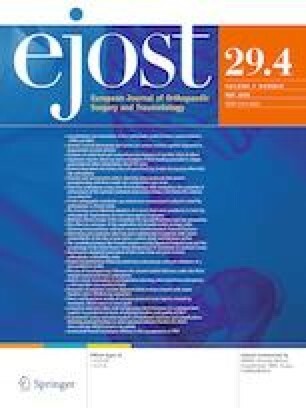 For trials comparing different surgical techniques, this evidence provides treating surgeons with the flexibility to utilise available resources and infrastructure to deliver patients care without compromising clinical outcomes. Further, for trials comparing different treatment modalities, this study helps to inform the shared decision-making process when counselling patients on the effectiveness of surgical interventions. Farrokhi 2017, Rožanković 2017, Xia 2017, Lee 2016, Loumeau 2016, Hou 2016, Engquist 2015, Mariappan 2015, Luo 2015, Vaccaro 2013, Chen 2013, Abbott 2013, Auerbach 2011, Cheng 2011, Coric 2011, Garrido 2010, Riina 2008, Wang 2008, Nabhan 2007, Zoega 2000. RCTs with multiple related publications: (Lanman 2017, Gornet 2017), (Sasso 2017, Sasso 2007, Sasso 2011, Heller 2009, Anderson 2008), (Park 2011, Phillips 2015, Phillips 2013), (Hisey 2016, Radcliff 2016, Ament 2016, Jackson 2016, Hisey 2015, Davis 2015, Hisey 2014, Ament 2014, Davis 2013, Radcliff 2016), (Delamarter 2013, Zigler 2013, Murrey 2009), (Mummaneni 2007, Burkus 2014). De Kleermaeker 2017, Gutiérrez-Monclus 2017, Orak 2016, Tarallo 2014, Chandra 2013, Sørensen 2013, Drosos 2013, Cresswell 2008, Gentili 2003, Padua 2003, Jugovac 2002. Bargar 2017, Atrey 2017, Schouten 2017, Dahlstrand 2017, Scemama 2017, Broomfield 2017, Verdier 2016, Langlois 2015, Gofton 2015, Mjaaland 2015, Briggs 2015, Glyn-Jones 2015, Gerhardt 2015, Meermans 2014, Gustafson 2014, Dienstknecht 2014, Small 2014, Lass 2014, Engh 2014, Tiusanen 2013, Lorenzen 2013, Vendittoli 2013, Penny 2013, Engh 2012, Howie 2012, Stocks 2011, Corten 2011, Thomas 2011, Corten 2011, Mutimer 2010, Smolders, 2010, Stilling 2009, Calvert 2009, Glyn-Jones 2008, Geerdink 2006, Grübl 2006, Luites 2006, Schauss 2006, Faris 2006, Wembridge 2006, von Schewelov 2005, Kalteis 2005, Kim 2005, Flivik 2005, Brodner 2003, Martell 2003, Freund 2003, Visser 2002, Tanzer 2001, Koessler 2001, Bose 2000, Berger 1997. Khare 2017, Mutsuzaki 2017, Venosa 2017, Reda 2016, Bottoni 2014, Kim 2013, Takeda 2013, Mirzatolooei 2012, Sørensen 2011, Zaffagnini 2011, Vogrin 2010, Ferretti 2008, Siebold 2008, Jepsen 2007, Zhao 2007, Zaffagnini 2006, Drogset 2006, Krywulak 2005, Yasuda 1997, Cameron 1995, Dahlstedt 1990. De Vloo 2017, Zhang 2017, Wang 2017, Vide 2017, Li 2017, Todesca 2017, Calliess 2017, Kim 2017, Jawhar 2016, Ahn 2016, Morrison 2016, Bell 2016, Camp 2015, Chen 2015, Alomran 2015, Fransen 2015, Hutt 2015, Dossett 2014, Nam 2014, Pornrattanama-neewong 2013, Altay 2012, Meijerink 2011, Blakeney 2011, van Jonbergen 2011, Zhang 2011, Varela-Egocheaga 2010, Higuchi 2009, Dutton 2008, Confalonieri 2007, Mullaji 2007, Chin 2007, Weeden 2007, Matziolis 2007, Kalairajah 2006, Cobb 2006, Ishii 2005, Bäthis 2005, Carlsson 2005, Decking 2005, Chauhan 2004, Sparmann 2003, Waters 2003, Price 2003, Reed 2002, Chiu 2002, Wood 2002, Stukenborg-Colsman 2001, Chiu 2001, Roysam 2001, Waikakul 2000, Levy 1999, Jorn 1999, Nilsson 1998, Newman 1998, Abdel-Salam 1995. Irha 2016, Buciuto 2014, Torkki 2001, Calder 1999, Klosok 1993.